As Science Fair season is upon us, what better to post about than science adventures! For our first science fair project, we dove into the world of crystals. It turns out they are a lot of fun to learn about, have simple concepts and really in depth concepts and take a REALLY REALLY long time to grow. I mean really, really. So, if you are a bit like us and are last minute creators, crystals may not be the right project for you. In any case, we did manage to find this wonderful recipe for borax crystal snowflakes and the best part is that they produce some nice results overnight! I don’t believe this video was available at the time we made these, but lucky for you it is now! The long and short of growing crystals is that you need a super saturated solution, meaning, you stir in something that dissolves into a liquid and you put in as much as you possibly can until you can’t make any more dissolve. 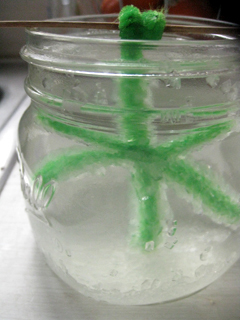 For the borax crystal snowflakes, it involved stirring borax cleaning powder into hot water. Then, you need something for the crystals to grow on. In this case, it was a pipe cleaner shaped like a snowflake. One of the cool things we learned is that based on the size of the crystals going in, you can predict the shape of the crystals coming out! We also tried a salt solution and a sugar solution (and did actually make rock candy!). The rock candy took the better part of forever- like a month undisturbed forever but did turn out cool. The salt crystals, while fun, were quite unimpressive to look at. In addition to the home made solutions, we did try out a commercially purchased crystal kit. The kit was small, with an impressive looking crystal on the front. We did grow some cool crystals from it, but the large crystal would take a LONG time and a lot of solution and the container inside just wasn’t that big. Probably possible, but we just didn’t have the patience. Growing crystals and participating as a family in the science fair was a lot of fun. I hope my kiddos want to do it again next year! Rating: 4-5 hands. Based on the chemicals you chose to create your solution, there are both heating and exact measuring involved. It is a science project, so there is lots of time to teach and learn together!! !